Fig. 8-1 shows in the process of cooling air cooled condenser. 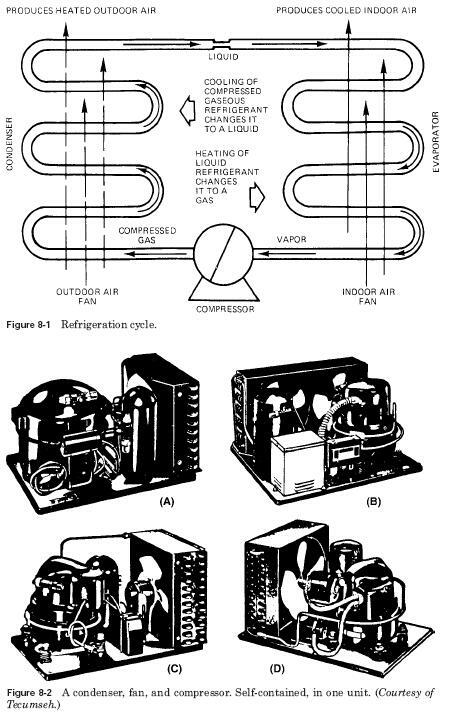 Figure 8-2 shows some of the different types of compressors and condensers mounted as a unit. These units may be located outside the cooled space. This arrangement makes it possible to exhaust hot air from the cooled space. Please note that the capacitor has a large-blade fan that blows air through the capacitor plates. Ribs attached to the coils of copper or aluminium tube. Tubes houses of liquid and gaseous vapors. When blown air contacts fins, it cools them. The heat from the compressed gas into the pipeline thus transferred fin cooler. The heat is on refrigerant vapor in the condensed environment includes both heat absorbed by the evaporator and the heat of compression. Thus, the capacitor has always load, that is, the sum of these two races. 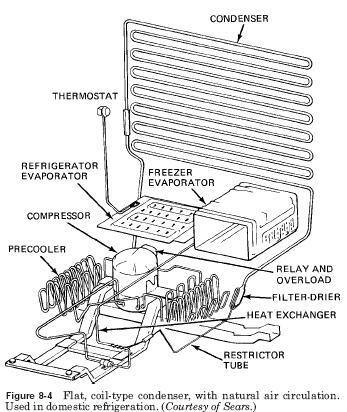 This means that the compressor should handle more heat than is generated by the evaporator. The amount of heat (Btu) given capacitor is estimated at heat per minute per ton evaporator performance. These capacitors are designed for different suction and condensing temperature. The more capacitor area of influence of the moving air stream, the lower the refrigerant temperature at the outlet of the condenser. The temperature of the air leaving the vicinity of the capacitor will vary depending on the load inside the area, being cooled. If the evaporator picks up the heat and transfers it to the capacitor, capacitor must transfer this heat in the air passing over the surface of the plates. Growth condensing temperature average passing through the condenser is directly proportional to the load capacitor. She is inversely proportional to the number and specific heat of condensation average. To use the heat, causing the field of cooling, to heat again, it is common practice for search of the capacitor outside the region that they are due. 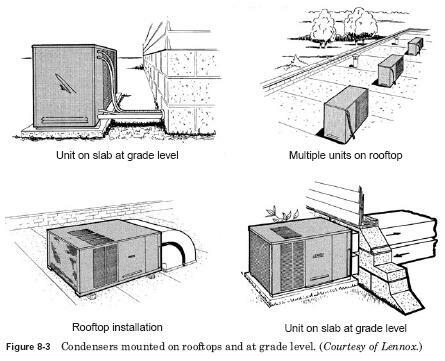 For example, an air-conditioned building, the capacitor is located on the roof or on the outdoor plate on a level surface (see Fig. 8-3). Some condensers are cooled by natural circulation of air. In this case in domestic refrigerators. Such natural convection capacitors use any surface of a plate or finned tubes (see Fig. 8-4). Air-cooled condensers, fans are used are classified as chassis and remote. Chassis-mounted shown in Fig. 8-2. Here, compressor, fan and capacitor is mounted as a whole. Remote view is shown in Fig. 8-3. Remote air-cooled condensers can be obtained sizes ranging from 1 to 100 tons. Chassis installation types are usually limited to or less than 1 tonne.